There won't be many secrets when France and Belgium meet in the World Cup semifinals, given the club overlap between the two rosters and the one glaring commonality–Belgium assistant coach and France legend Thierry Henry. ST. PETERSBURG — The threads connecting Belgium and France were always there, even as they were stretched by two years of qualifiers, a group stage, exotic venues like Kazan and Rostov-on-Don, and knockout-round opponents like Lionel Messi and Neymar. Their journey here, to the threshold between Europe and Russia and the threshold of a World Cup final, was never inevitable. The French were favored, but often didn’t appear to be playing their fluid best. The Belgians faced a two-goal, second-half deficit against Japan, and then a second-half onslaught by Brazil. But they endured. And as a result, these half-siblings, which already share bits and pieces of their history, border, language and flag—not to mention significant and intriguing soccer ties—will share the field here at Krestovsky Stadium in Tuesday’s semifinal. The threads will knot. There’ll be backyard bragging rights at stake, of course. And then there’s the matter of the role of favorite in the July 15 World Cup final. There are some unknowns heading into the semi. Will Belgium continue with the 4-3-3 that bedeviled Brazil? How will coach Roberto Martínez handle the suspension of right back Thomas Meunier? Is Olivier Giroud’s contribution as a target forward and facilitator sufficient for a French side whose attack has looked sluggish against teams committed to defense? But there are no secrets. “We know them more than well. And they know us more than well,” Lloris said. The goalkeeper who plays for Tottenham Hotspur shared a London locker room last season with three Belgians who’ll be opponents on Tuesday—Toby Alderweireld, Jan Vertonghen and Mousa Dembélé. And Lloris pointed out that he also used to play with round-of-16 hero Nacer Chadli, who’s now at West Bromwich Albion. Overall, 17 of the 46 men on Belgium and France play in England, and Manchester United, Chelsea and champions Manchester City feature players from both countries. A Chelsea training session, for example, is this semifinal in miniature. It would include Belgium’s Thibaut Courtois, Eden Hazard and Michy Batshuayi, and France’s Giroud and N’Golo Kante. Barcelona, Paris Saint-Germain and AS Monaco also had players from both sides last season, and there are several more links and crossed paths from past years and different clubs. Then there’s the face that’s as famous as it is familiar. This semifinal didn’t need any additional subplots, but in Thierry Henry, it has one that’s compelling and historic. Deschamps is two games away from becoming just the third man to win the World Cup as player and head coach. Martínez, a Spaniard, could be the first to lead a foreign nation to the title. But there's no category for what Henry is doing. He’s a Les Bleus legend, a world and European champion, and as Lloris reminded us off the top of his head on Monday, the national team’s all-time leading goal scorer and second-most capped player. And he’s Martínez’s assistant for Belgium. What he’s done as a player in the past, however, is a big part of why Martínez brought him aboard. France was an underachiever—until it wasn’t. It was a country that produced world-class talent on the regular but had nothing but World Cup frustration to show for it, at least until 1998. Deschamps was the captain and Henry the 20-year-old prodigy on a team that won it all in Saint-Denis, then went on to claim the Euro 2000 and two Confederations Cup titles, and then a spot in the ’06 World Cup final. Belgium isn't nearly as much of an underachiever. It’s a smaller country with a smaller league, and expectations historically have been lower. But it’s obviously sitting on a generation of talent that can only be considered a mother lode for a nation of its size, and after slipping up at the 2014 World Cup and Euro 2016, it’s running out of chances to see it pay off. 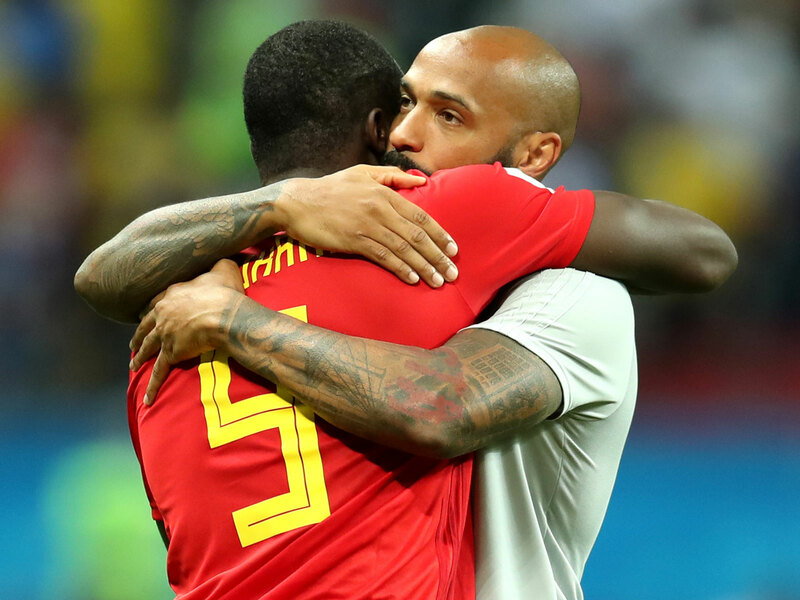 Martínez has called Henry “a psychological weapon.” On Monday, the head coach said, “What he’s brought is something we didn’t have … What we didn’t have was international experience, the know-how of winning a World Cup; the know-how of being a footballer [who’s] expected to perform in front of the eyes of the world and knowing how you feel in those moments. Thierry Henry brings that, brings the calmness of giving the players the understanding of what they’re going to see going into the unknown as a Belgian footballer or Belgian generation. Henry is now two games away from winning a World Cup with two different countries. He has said that he doesn’t believe he turned his back on his own. Coaches work in foreign lands all the time, and Henry was never offered a position by the Fédération Française de Football. Which is to say, these are teams that—on several levels—have been on a collision course. European countries are dominating the World Cup and right now, no European countries are developing better players than France and Belgium. They’re both on the right trajectory. There’s young talent, in-their-prime talent, and close calls in the recent past that herald a more glittering future. France lost to Germany in the 2014 quarterfinal then won silver at Euro 2016. Both are getting closer. Both are good enough. The biggest difference between the two will be revealed Tuesday night, when one begins looking toward the World Cup final and one sees its championship dreams end.